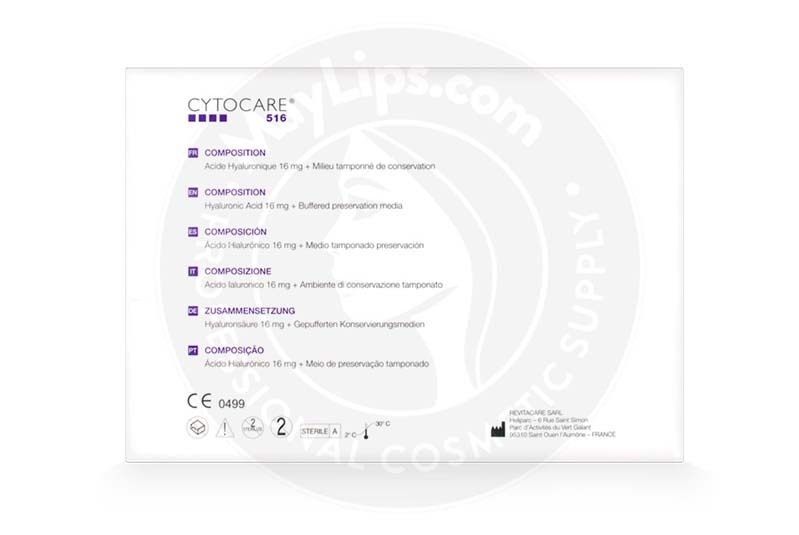 Cytocare 516 is an injectable cosmetic filler composed of hyaluronic acid and rejuvenating complex CT50, and is formulated to treat fine lines and wrinkles, rejuvenate dehydrated skin, and add density to improve the radiance of the skin. This product is manufactured by Revitacare Laboratories in France as part of the Cytocare range of Class III medical device products. This filler comes with 10 vials of 5ml of solution. Packages should be stored in conditions between 2°C to 30°C to ensure quality of the filler. This cosmetic injectable is designed for middle-aged skin, typically for patients between the ages of 35 to 50, to fill fine lines and wrinkles and prevent further development while rehydrating and protecting the skin. This non-surgical cosmetic solution is used to correct early signs of aging and stress in the skin. It is specially formulated to smooth early fine lines, restore hydration, improve radiance, and increase tonicity and elasticity of the dermis for an overall younger, glowing appearance. Cytocare 516 is used to improve the biological capacity of the skin to reduce and repel signs of aging by targeting the biological foundation of the skin cells, so individuals radiate health from the inside out. This filler can be used on the skin all over the face, neck, and the back of the hands, but is not indicated for use on eye circles, glabellar wrinkles, or in the lips. 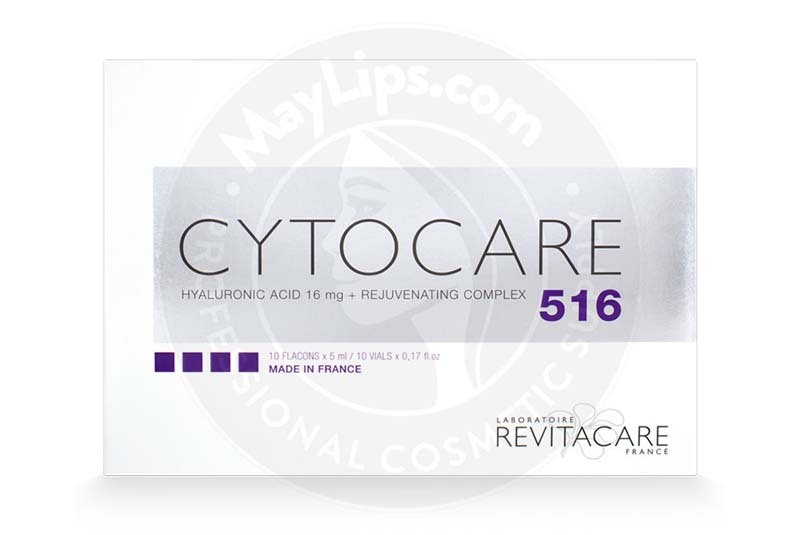 Cytocare 516 works by targeting the skin cells in the superficial layer of the dermis, allowing for high hydration and replenished elasticity. As the skin ages, the naturally occurring hyaluronic acid begins to deplete. An injection of Cytocare 516 with its non-crosslinked hyaluronic acid formula will restore density and repair the internal environment of the skin. Additionally, the solution is full of vitamins and inorganic salt, which improve circulation in the skin cells and increase cellular respiration. By targeting the biology of the cell, this specially formulated filler helps to regenerate tissue and restore the epidermal barrier, helping to protect the skin from signs of aging and restoring elasticity and tonicity to the treated area. 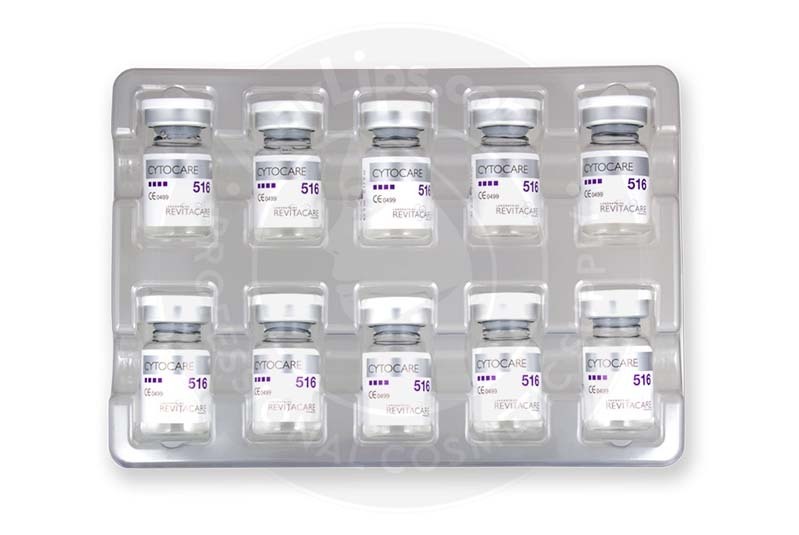 Injection of this product also helps to encourage new cell growth due to the presence of dimethyleminoethanol, which stimulates activity of the fibroblasts and myofibroblasts. The vitamins present in the formula add a final layer of protection and introduce antioxidant activity. Results appear instantly and present an overall refreshed, rested, and youthful appearance to the skin. As with all similar procedures, this product should only be administered by a medical practitioner and only after the patient’s medical history has been discussed. Disinfect the treatment area with an antiseptic. Use a 30G needle to inject into the middle dermis or superficial dermis layer of the face, neck, or back of the hand. The manufacturer recommends a point by point, retro-tracing, fan injection, or cross-hatching technique, though the application technique will depend on the area being treated. The solution should be injected slowly with even pressure being applied to the needle. Once injection is complete, gently massage the area of treatment to ensure even distribution. For best results, the manufacturer recommends that injections to be administered in 3 sessions over 3-week intervals, though the number of sessions as well as the concentration of solution used will depend on the condition and maturity of the skin. As always, results vary depending on a number of factors. However, clinical trials how shown that the average duration of effects is typically 3 months. For lasting and maintained results, the manufacturer recommends that continued touch ups should be administered by 1 session every 3 months. Results will vary based on the age and lifestyle of the patient as well as the application technique used and the area of treatment. Cytocare 515 is a non-cytotoxic, non-irritant, non-sensitizing, and non-mutagenic solution that is completely biocompatible. The safety of this filler has been assured through clinical studies and countless treatments. There are also common mild side effects and possible reactions associated with the administration of this product. There are possible reactions and mild side effects associated with the use of Cytocare 516. Any reactions or mild effects should appear immediately after treatment, and should resolve themselves without intervention within two to three days. If patients experience any prolonged effects or any reactions other than those listed by the manufacturer in the information leaflet, the manufacturer should be notified immediately. 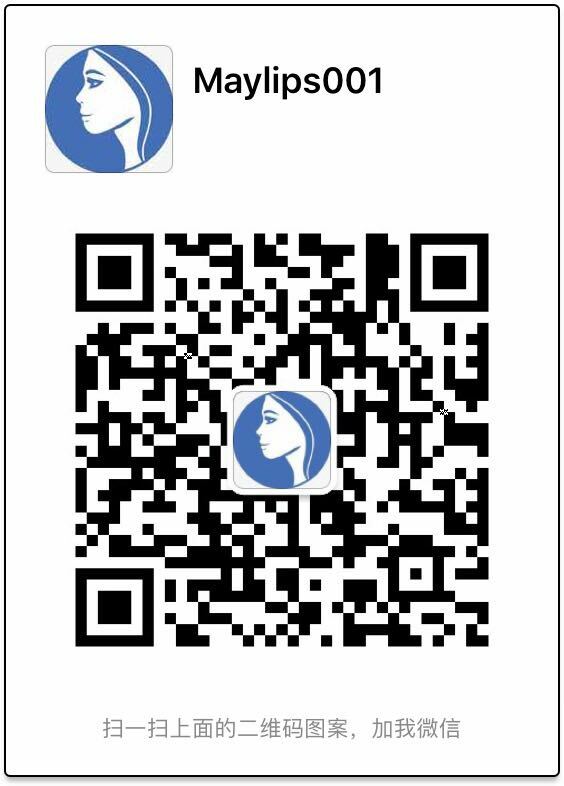 The manufacturer lists contraindications for this filler, advising that this product should not be used: if the individual has a known allergy or hypersensitivity to hyaluronic acid or any of the active ingredients; or if the patient is pregnant or breastfeeding. 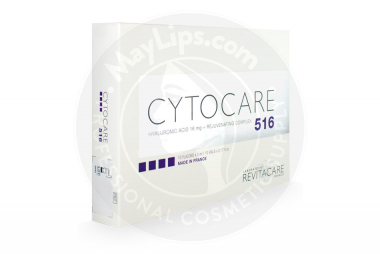 Cytocare 516 is formulated primarily of hyaluronic acid at a 16mg concentration and of CT50 rejuvenating complex. This solution also contains a multivitamin complex for antioxidant protection, which is made of nicotinamide, retinol, pyridoxine, thiamin, riboflavin, dexpanthenol, ergocalciferol, ascorbic acid, and tocopherol. 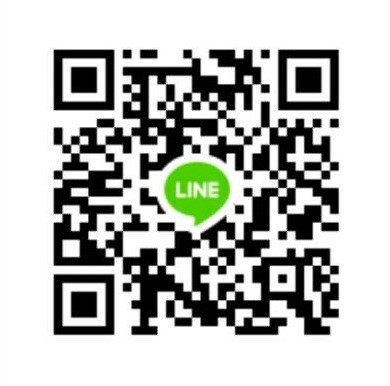 You can find additional active ingredients listed by the manufacturer in the product pamphlet. Size: 10 vials x 5mL .